This week a Scientific American Blog Post by Radhika Nagpal, professor of Computer Science at Harvard made a circulation among my academic Facebook friends, and I thought I'd share it with this community. I created a “feel-good” email folder. While I am not sure if her mindset is as easy to adopt in other subject areas (like astronomy) where the alternative/industry options are less plentiful and the transition out of academia is less obvious, I am happy to hear that someone who only works 50 hours a week was able to obtain tenure at Harvard. This week’s guest blogger is Sethanne Howard, an astronomer who has held positions with U.S. national observatories, NASA, the National Science Foundation, and the U.S. Navy. She was also Chief of the U.S. Nautical Almanac Office, 2000-2003. Her research specialty is galactic dynamics. She has also been active in science education, especially concentrating on the history of women in science. There are many paths to becoming an astronomer, almost as many as there are astronomers. My path was a squiggle of overlapping tracks. Like many astronomers I knew what I wanted to be from age 5. I read the Little Golden Book on Stars. There were a series of little golden books on the natural world, one on rocks and minerals, one on flowers, one on insects, birds, etc. The one on stars was divided into two parts. Part two was easy to understand. It consisted of a page per constellation with a drawing of the constellation at the top and a description at the bottom. My 5 year old mind could understand pictures in the sky. Part one was more difficult. It was text describing the science of astronomy. I read it carefully not quite understanding everything until I got to a page on how stars evolve. There was this graph on the page. [Graphs are not part of a 5 year old’s concepts.] There were big white-blue stars at the top left, smaller yellow stars in the middle and even smaller red stars at the bottom right. Obviously (to my 5 year old mind) stars rolled down the line as they aged, changing color as they rolled. Well, the words at the bottom of the page did not agree with this. So I was puzzled, and this puzzlement stayed with me until I figured out the H-R diagram many years later. The puzzlement kept me interested in astronomy. I kept returning to that page year after year until I could understand it. 6. Why don't we appreciate smart women? The AAS DPS Professional Development Subcommittee is pleased to open this year’s application cycle for the DPS Dependent Care Grant program. Up to $250 per applicant is available for DPS members to subsidize child, elder, or disabled dependent care during the DPS conference week (6-11 October 2013). Funds may be used either at the DPS meeting location or at home. Preference will be given to those presenting and those with the greatest financial need. I had the privilege of meeting Dr. Niebur before her untimely passing, and I was always impressed by her energy and enthusiastic support of women in science. I am pleased to see her legacy live on through this fund. I hope that it will enable many early career scientists with children to fully participate in this year's DPS Meeting. When CSWA first started compiling advice on applying for tenure-track positions, we got some great suggestions on negotiating from Alison Coil. Alison is an associate professor at UC San Diego in the Physics department and Center for Astrophysics and Space Sciences. She was previously a Hubble fellow at the University of Arizona and a graduate student at UC Berkeley. She is an observer who works on galaxy and AGN evolution. A few years back UC Berkeley did a study of the mental health of graduate students. The results were quite astounding. The study found that 67% of graduate students said they had felt hopeless at least once in the last year; 54% felt so depressed they had a hard time functioning; and nearly 10% said they had considered suicide (note that in the graph below shows considering suicide "frequently" or "all the time", thus the percentage difference). 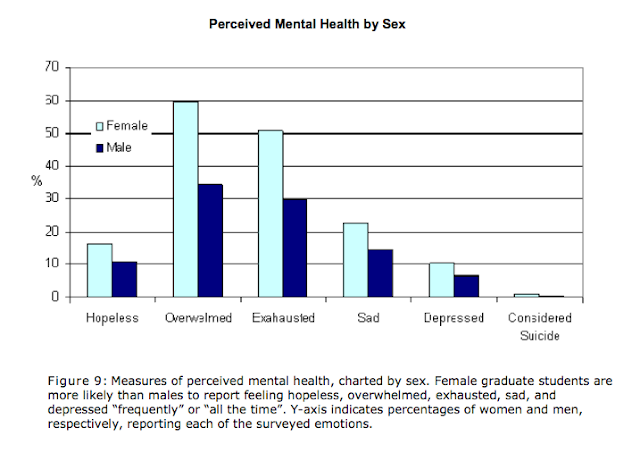 Female respondents were more likely to report feeling hopeless, exhausted, sad, depressed, or suicidal. By comparison, an estimated 9.5% of American adults suffer from depressive disorders, according to the National Institute of Mental Health. My wife, Ellen, and I are both scientists, married in graduate school, got jobs in the same city, had two kids and survived to tell about it. Here is the story of our schooling and jobs. Next time, I'll write about childrearing. We were both graduate students at Caltech, living in the grad student dorm. There were 3 women and 60 men who wanted to live in the dorm, so the solution in those days was to simply put the 3 women in the men's dorm. More than a little social pressure on the women, but the men tried to be considerate. We had to be discreet when dating to avoid ribbing and soon moved out to our own place. Marriage in Dabney Gardens with research groups and dorm friends in attendance. The next hurdle was to graduate at the same time and find jobs. Ellen's group typically graduated in 5 years and mine in 7. No big deal. A casual meeting between my wife and my advisor settled the deal with me allowed to graduate in 5 years. I never found out what was said! It was a huge pile of work to get the research done in time, but I got out in 5 years, still a record. We explored a large number of opportunities for post-doc positions, and finally settled on U. Maryland and Goddard, fortunately each was a top choice for each of us. It was not easy to find two physics positions near each other, but we were lucky to have both institutions work together from the start to make it happen. With a house half-way in-between, we were both within biking distance of work. Those post-docs turned into permanent jobs, so we fortunately did not need to repeat the two-job trick. Being now on the hiring side of the equation, I see how difficult it is to arrange dual jobs. These days, the dominant reason for a hiring action to fall through is not finding a suitable position for the spouse. There is no easy solution, but the most successful institutions ask the spouse question right up front and immediately start looking for a joint solution. Next time … how we managed to raise kids during the intensive early years of two careers. Enough time has gone by that I can now tell this story without fear of breaching confidentiality. I “recently” chaired a NASA proposal review panel. The identity of the panel members is generally confidential; you don’t know the participants ahead of time, and you don’t discuss the results after the panel business is complete. I have participated in these reviews since I started in solar physics – almost 25 years ago. My name comes up every two or three years, and I head to DC. The panel spends several days reviewing proposals, and comes up with a ranking for NASA. The process usually works pretty well. In all the years I have been doing this, I have never been part of a panel that was chaired by a woman. (Since the panel membership is not public domain, I only have information on the panels I have served on.) I have noticed a trend – the panel chairs used to be more senior than me, then about my level, and recently, younger than me. These chairs can be reasonably effective or not particularly effective; in some cases, the NASA discipline scientist takes over most of the chairing duties, so the panel still gets the job done. A few months after participating in the panel review process, I happened to run into the NASA discipline scientist at a conference. The situation was right to have a quiet word about this business of chairing panels. It did not take me long to realize that I had walked right into a trap! Always on the lookout for panel members, he immediately asked if I would chair a panel in the next round of reviews. I was expecting to do this in two to three years, not two to three months. But I had asked for it, and here was an opportunity. I simply had to agree to chair the panel. What does it take to succeed in academia? How is success measured? For students entering graduate school, at least in many physics departments, the answer would seem to be "high GRE scores." Recently I attended the APS Bridge Program Summer Meeting 2013 where much attention was directed to another factor that is harder measure but, many believe, ultimately more reliable: perseverance and passion for long-term goals. Sometimes called "fire in the belly", this personality trait is known in the world of social psychologists as Grit. An inspiring introduction is given by Angela Lee Duckworth. In my household growing up, the word for grit was Sisu -- a Finnish word that is central to my cultural background. Finnish Sisu repelled the Soviet invasion in the Winter War of 1939 . Although Finland lost 11% of its pre-war territory, it preserved its independence and gave the world a new word for "guts". One young Finnish farm girl -- my mother -- later emigrated to the U.S. and taught her son the significance of Sisu. Sisu got me into academia. A rocky start in college led to an instructor advising me not to pursue theoretical physics. After switching into radio astronomy I recovered well enough to get into the Princeton astrophysics graduate program, where I was initially assigned to work on a project in theoretical cosmology. My preparation was inadequate for the problem at hand and after a semester I moved on. However, I wanted to solve the problem assigned to me so badly that I spent two years teaching myself fluid mechanics and mathematical methods of self-similarity without telling anyone, until I made a breakthrough. When I presented my first-year supervisor the draft of a paper and asked him if he recalled the project and would comment on the suitability for publication of my solution, he was stunned. I learned that he, too, had been interested in finding the solution and had enlisted the collaboration of a senior theorist from Japan. Independently, they had just completed a paper on the same problem. Our methods differed but our results agreed, and my supervisor kindly encouraged me to publish my work as a solo paper. It was my first publication and the launching point for a career in theoretical astrophysics. The next time a colleague asks about an applicant's GRE scores or "intelligence", ask him or her if they wouldn't rather know about Sisu and other personal qualities that do not correlate with performance on standard exams. 4. Where are all the women professors? Among the recently hired! 5. The Numbers Game: Where are the Women? 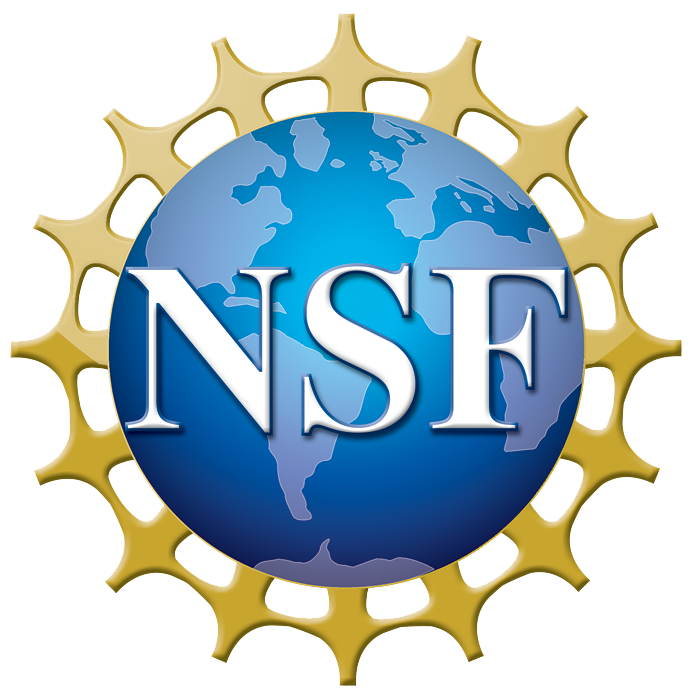 The NSF just released a Dear Colleague Letter (DCL) announcing a very interesting initiative for postdocs: In short, principal investigators of NSF grants can submit a request for supplemental funding to cover salary support for additional personnel to sustain research while the postdoc is on family leave. Talk, as they say, is cheap. So, what is noteworthy here is that there is real money on offer, which indicates that the NSF really means to take on this problem. So, how much money is the NSF setting aside for this? The DCL offers 3 months of salary support, for a maximum amount of salary of $12,000. Importantly, benefits and overhead can be on top of this. At Harvard these rates are 28% and 69%, respectively, and so the real cost would be just shy of $26,000. The program appears to be NSF-wide, and so potentially this will add up to a significant total. (1) Check out the CSWA resources page for information on the two-body problem, work-life balance, sexual harassment, mentoring, unconscious bias, diversity, and taking a career break. (2) Download Why So Few? from AAUW (it’s free). The report presents evidence that social and environmental factors contribute to the underrepresentation of women and girls in STEM. Focus on any chapter – they are all good! Two of my favorites: Stereotypes and Spatial Skills. They even have a ready-made powerpoint presentation. Where are all the women professors? Among the recently hired! 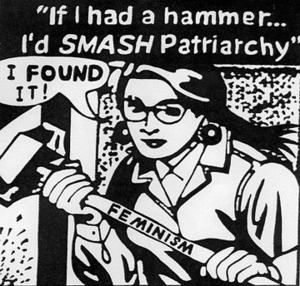 I recently wrote a series of posts entitled "Where are all the women professors?" here and here. I began with a simple premise: "men and women are equally capable of succeeding as professional astronomers. There is no inherent (intrinsic) difference in mental capacity, creativity, ability to learn, or any other factor that plays into the success of an astronomer." From there I examined the role of unconscious bias as one of the factors in a "leaky pipeline" that has resulted in an underrepresentation of women among astronomy professors. A commenter wondered, "What is the fraction of women hired on tenure track during the same time period as the statistics of the graduating students?" While the present representation of women among various astronomy faculty hovers somewhere around 15%, is there evidence that there have been improvements in recent years? The question stuck with me, but I wasn't sure how to assess it. However, the method recently became obvious: the Astronomy Rumor Mill!